We Are the Real Mink Hair Vendor And Real Mink Lash Vendor in China, Our Customers Are All Over The World. Our 100% Human Unprocessed 10A Grade Mink Brazilian Hair is The Highest Quality Hair Extensions On The Market. There are no additional charges for drop ship. Just order online the same way as usual, but add different shipping addresses for your customers. 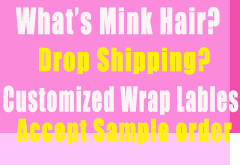 Drop shipping means we can ship the mink hair out with your own brand wrap labels to your customers directly, and your customers won't know we are your vendor, they only can see a FedEx/DHL office address. So please don't worry, we already help many many customers do drop ship. And you don't need to keep a lot of inventory of hairs. 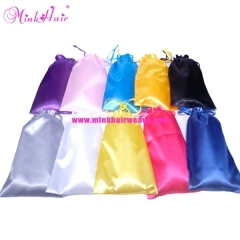 We will ship hair out with 48hours after payment..
MINK HAIR Main Product: Mink Hair Bundles (Mink Brazilian Hair Bundles, Mink Peruvian Hair, Mink Malaysian Hair, Raw Indian Hair, Mink Cambodian Hair, Mink Burmese Hair), Lace Closure, Lace Frontal, 360 Lace Frontal, Platinum Blonde Hair, Full Lace Wigs, Blonde Wigs, Front Lace Wig, Ombre Color Hair, Two Tone Hair, Ombre 1B/613, 1B/Grey Hair, Ombre 99J Hair, Ombre Pink Hair, Red Hair, Purple Hair, Blue Hair, Clip In Hair, Tape In Hair Extensions, Ponytail Hair,. Mink Hair Textures: 8 Textures, Body Wave, Silky Straight, Loose Wave, Deep Wave, Mink Curly, Italian Wave, Water Wave, Loose Deep Wave.